I am sure you are familiar with Clement C. Moore's Christmas poem, 'Twas The Night Before Christmas, which most of us can recite at least part way through. The poem has been altered and parodied in hundreds of different ways, from books like Dr. Seuss' How the Grinch Stole Christmas to pretty much any holiday movie. And now I've finally found a gothic parody of the poem! I'm not sure who the author is, and the website hasn't been updated since 2006, but this is one of THE BEST gothic parodies of this poem I've ever read! I hope the author doesn't mind me reposting, because this poem really bears sharing! I sprang from the coffin to find out the matter. Expecting to find a dark devilish host. And eight skeletal creatures that might have been deer. Now, Murphy! Now, Morgoth! Now, Torment and Woe! On, Dreadful! On, Lovecraft! Mephisto and Poe! To the top of the gravestones where fog wisps its breath! With a weight on my soul I consign you to death! While dearest Bianca, like death, still but slept. The clicking and scratching of each bone-white hoof. Down the ebony chimney he came without sound. And the Spandex and fishnets 'round his legs were ripped. A black eye-liner'd face neither youthful nor old. And his sorrowful face was as white as my shirt. And a sharp scent of brimstone and cloves choked the air. And I felt the full weight of his angst and dread. And away they all drifted like early dawn's mist. 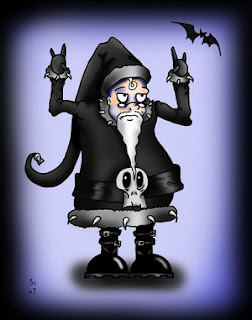 "Gothic Christmas to all, and to all a good fright!" Extremely well written and funny indeed!